Officials at the launching of the tournament. collaboration with Netrockers FC launched a U20 Round Robin Community Cup Tournament on Thursday last at the Bayroc Community Ground which runs from August 22nd (Friday) to September 07th, 2014. 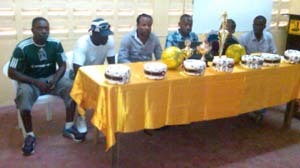 Collis Gift said that the UDFA and Netrockers FC are instrumental in promoting and developing football for the youths. He explained that the tournament is to bring out the next generation of football not only in the Region but by extension Guyana. Gift told the small gathering of UDFA officials and members of the various clubs that in the tournament teams have twenty four hours after a game is played to appeal anything they feel was wrong and the organisers have twenty four hours to respond. He reminded them that the teams must be punctual and be committed to their game. Hamid also explained some of the FIFA rules to the players and encouraged them to protect the image of the sport. He also said he is willing to impart some knowledge of the spot to young players during some lectures which he will be doing during the tournament about offside, misconduct and other issues. Prizes will be given to the first, second, third and fourth place finishers, best goalkeeper and the most goal scorer. A bicycle will be given to the Most Valuable Player. Ten clubs will vie for the top spot; Netrockers FC, Botofago FC, Eagles United FC, Kara Kara FC, Vasco FC, Winners Connection FC, Coomacka Mines, West Watooka, Retrieve and Amelia’s Ward. Treasurer of the UDFA Basil Jaipaul thanked the sponsors, noting that without them it (tournament) couldn’t be possible. Caribbean International Distributors Inc (CIDI), Bernard Variety Store, Snooks Variety store, Chicken Stag Bar, Figgy’s Groceries, Wills Electrical, Rubis Guyana Inc., LJ shopping Zone, Rite care Pharmacy, Uncle, Foreign Links Auto Parts, Mayfield Clothing, Dexter Copeland, Randy Hall, Sox, Andy, Bunny, Abdulla Hamid and Stanley Lancaster.